On Victory Day ASU Association of International Students (AIST) held a special event for World War II veterans. The holiday dedicated to Victory Day celebrations was supported by ASU authorities and public administration. Foreign students responded to the idea enthusiastically. They were glad to deliver greetings to the veterans of war and homefront workers on such a significant day. 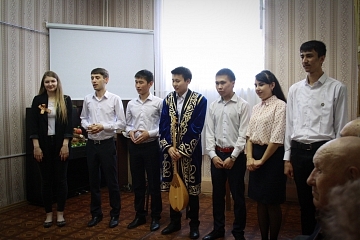 Students of Altai State University prepared a beautiful performance and sang their favorite war songs. They also played their national musical instruments and recited poems about war both in Russian and their mother tongue. 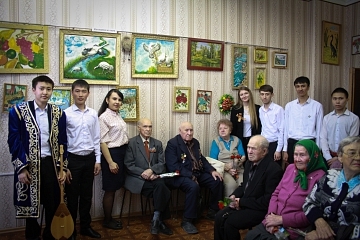 On behalf of Altai State University, foreign students expressed their deep gratitude and presented veterans with small gifts that included St. George Ribbon, red carnations and chocolate. In the late evening veterans had tea in comfortable and inviting atmosphere and shared their memories of the World War II. Each of them had a different destiny and a different life story, to which student listened with great interest. It was clear that veterans and students enjoyed the event.